The U.S. Patent and Trademark Office on Tuesday issued Apple a patent for a system that leverages the iPhone's various sensors to seamlessly increase and decrease volume, as well as switch between the device's multiple speakers, depending on how far away the handset is from a user. Apple's U.S. Patent No. 8,452,020 for "Adjustment of acoustic properties based on proximity detection" describes a method in which data from the iPhone's proximity sensor is employed to calculate distance from a user, which is then applied to dynamically adjust volume. While the property covers a number of sensors, including cameras and passive light sensors, among others, the most obvious would be the front-facing infrared sensor that is already used to turn the multitouch screen on and off during calls. Any applicable component can be used, though it must be capable of providing distance data in some embodiments. As noted in the patent language, the invention can dynamically adjust volume based on distance away from the user. 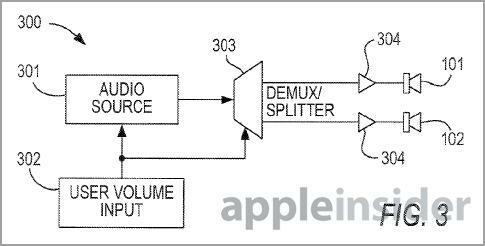 This action can apply to both the iPhone's receiver as well as the speaker, depending on which sound output mode is selected. In another embodiment, the phone will fade from the receiver to the speaker if a predefined distance between device and user is reached. For example, if a user starts a conversation holding the iPhone to their ear, and puts the device down on a desk or chair, the proximity sensor will note the change and switch to "speaker mode." 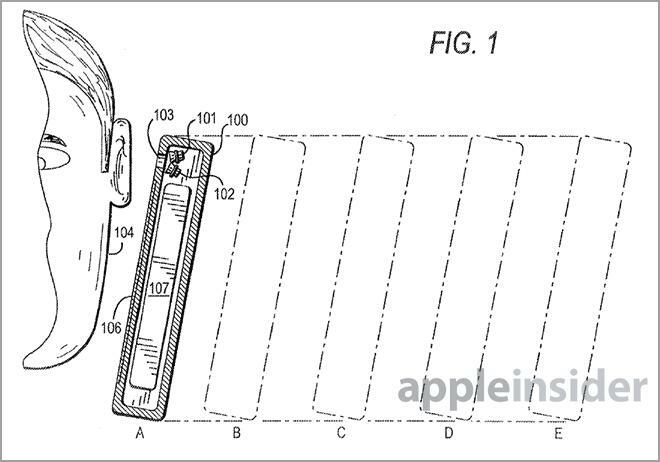 Apple suggests user profiles can be used to implement the proximity-based system. For example, in the illustration at the top of this page, position A would relate to a "normal" profile in which the receiver operates at regular volumes. At the other end of the spectrum, position E would trigger a "speakerphone" profile that routes audio output to the handset's loudspeaker. Through positions B through D, receiver output can be boosted, then ultimately faded to the speaker as the device moves farther away from a user's head. It should be noted that both the receiver and speaker can be operational at the same time, allowing for a more efficient and seamless transfer of output audio. The patent also accounts for frequency and gain adjustment based on proximity and environment, which are controlled by various circuitry arrangements involving filters, amplifiers and audio demultiplexers (demuxers)/splitters. Illustration of circuitry as described in one of the patent's embodiments. As the iPhone's buttonless multitouch screen ushered in the new normal in smartphone design, the proximity sensor quickly became an integral component in making phone calls. Apple has seen its share of issues with the technology, however, including hardware calibration problems with the iPhone 4. When Apple's fourth-generation handset launched in June 2010, customers complained of proximity sensor issues that would randomly turn the device's screen back on during a call, allowing for errant screen touches. The problem was solved in an update to iOS three months later. More recently, a lawsuit pertaining to Apple's alleged misuse of a Motorola proximity sensor patent was recently thrown out by the U.S. International Trade Commission. Google is in the process of appealing the dismissed case. It is unclear if Apple will implement the feature in an upcoming iPhone, but the hardware needed to deploy the tech is either readily available or already found in existing models. Apple's proximity sensor control patent was first filed for in 2008 and credits Justin Gregg, Michael Lee, and Chad Seguin as its inventors.